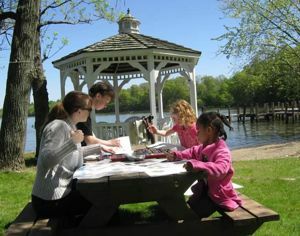 Still Water offers regular opportunities for community members and their families to practice mindful living together. These include retreats in May and November, and Family Feasts or Fun Days, timed around the seasonal equinoxes. Our times together are intentionally intergenerational and child-inclusive, infused with a gentle mindfulness, and guided by an aspiration to create and nurture community. Activities and practices are geared towards children of all ages, their parents and caretakers, and other interested practitioners. Still Water also facilitates the sharing of resources and supports deepening practice for those on the path of parenting. The community maintains an email announcement list through which we share information, teachings, and announcements related to Mindful Families programs. You may subscribe by emailing swmindfulfamilies@gmail.com.